Toys R Us starts Friday, April 28 to Thursday, May 2017. on cover you find Starwars Day May the 4th be with you see page 4 for details. All Disney beauty and the beast live action film dools Toodler belle red dress & Cape Doll save 25% off. New Nintendo switch includes (Nitendo swithc console, Joy-Con Controllers, Joy Con Grip and straps, HDMI cable and AC adapter) price 399.99, Mario Kart 8 price 79.99, All marvel figures vehicles and role-play save 30% off, Select Lego marvel super heroes building sets save 20% off. 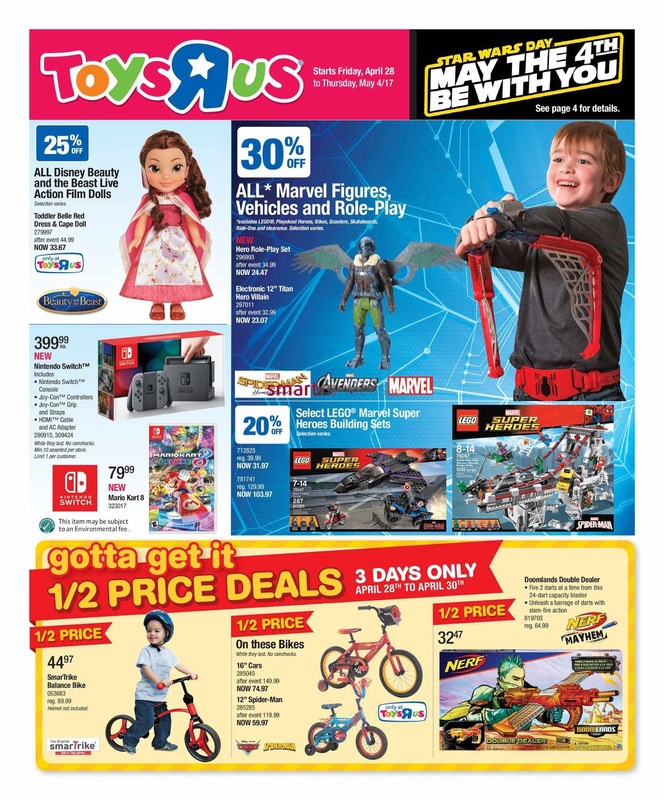 12" Spider-Man Now $59.97, Doomlands Double Dealer 1/2 price $32.47. On these bruin toys price $1347 ea 1/2 price, Sit n'stand skyway price $32.97 save 40% off, All $19.99 and up Thomas wood and trackmaster toys new wooden railway on the glow cargo 25% off, On these imaginarium discovery items Giant Activity cube now 49.97, 150-Piece wooden blocks now 19.97, 75-Piece wooden blocks now price 19.97, 75-piece wooden blovks now 12.47, All Imaginarium Easels draw and display easel now $52.47 ea save 25% off, All Imaginext toys DC super friends gift set now $19.97, Batman Deluxe Batmobile now price $26.97 save up to 30% off, These Furniture Items storage organizer with bins now $59.97, 2-in-1 Construction Activity Table & 2 Chairs set now price 49.97, All Lego Juniors Building sets price now 14.37, First builders 1-2-3 Learning Train $11.47 1/2 price, See toysrus.ca/freeshipping for details.